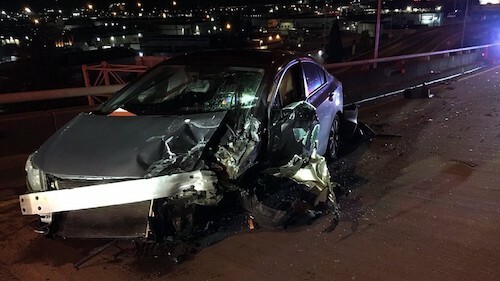 Seattle police say that two drivers were badly injured Monday night in a head-on collision on the West Seattle Bridge that is believed to have involved a suspected DUI driver. According to KOMO News, a Honda Civic was traveling east in the westbound lanes of the bridge towards Interstate 5 just after 10 p.m. The wrong-way vehicle collided head-on with a Toyota Prius which was traveling in the proper direction. Both drivers were transported from the scene of the collision to nearby Harborview Medical Center, where they were both reportedly in critical condition due to their injuries. The initial collision led to a second impact with a third vehicle, though the driver and passengers in that car were unharmed. Police told reporters that the 28-year-old driver of the Civic – which was traveling the wrong direction at the time of the crash – will be arrested for investigation of DUI and vehicular assault. Establishing liability for a serious injury crash caused by a driver who was under the influence of alcohol or drugs at the time of the collision is relatively straightforward, especially for an experienced personal injury attorney. Drunk drivers who cause accidents are difficult to defend, and insurance companies are typically quick to accept liability in these situations. One of the more common legal issues we run into in DUI crashes is insurance, or a lack thereof. Drivers who drive drunk are often irresponsible in a number of ways, and we often find that they do not have adequate insurance to provide coverage for the people who have been harmed as a result of their negligence. The award-winning auto accident attorneys at Davis Law Group have decades of experience investigating and handling serious auto accident claims, including those involving a drunk driver. We are proud supporters of Mothers Against Drunk Driving (MADD) and have helped thousands of crash victims achieve justice and hold negligent drivers accountable for their actions. Our office can assist you with a thorough investigation into the circumstances and facts involved in your case, in addition to determining if there are other potential defendants who may be legally liable for your injuries. Contact our office in Seattle for a free case review today. We will meet with you for a free legal consultation and help you better understand your legal rights and options. Call 206-727-4000.